Well I am still very excited but I completely understand that to most other members of the world population these are nothing but bubbly, nasty skin infection type pots. It was really rather reduced at the end, and there wasn’t much I could work out to do about it. I could blame it on my phone a friend of the Fitch variety for having gone to his drama night (honestly! 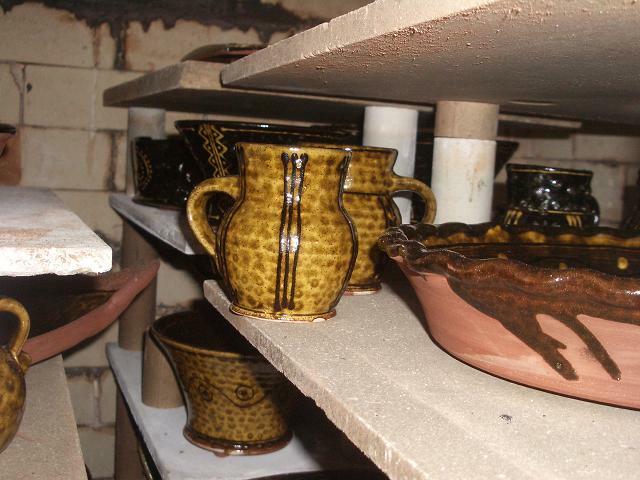 you can’t get the quality of slipware woodfiring potter phone a friends these days!) but I don’t think I could have changed it much anyway. I had lots of chunky wood and split pallets were my thinnest stuff but even that seemed to be just too much. I put up wanted notices over the weekend for thinner wood and have quite a few places to try now. It used to be easy around here to get the side rippings from the saw mills but almost all of the mills in the region now sell all their offcuts direct to a wood chip fired power plant in Lockerbie. Anyway a few leads to chase up over the next week or so. 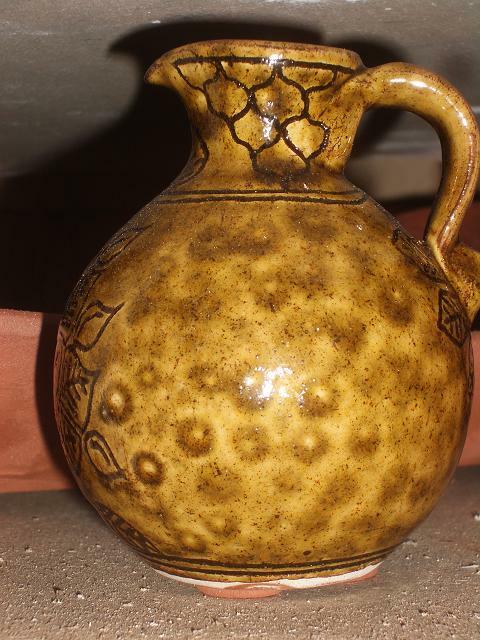 This first wee jug is very sweet, looks like a leopard, it was the first thing I took out, I could see him through one of the spy holes. The two wee mugs are ok too, when I say ok I mean they aren’t covered in the blisters. I was so excited after the firing that I couldn’t sleep that night till really late but planned a lie in after a couple of very late nights and early starts. So what happened the next morning? PING!! Wide awake bright and early, typical! Nice plate, shame about the warts. I had a pale glaze test in there too, it’s pretty insipid, I know I wanted paler but this is a bit grim to me. It is nicely melted and smooth on this side of the pot though. Anyway I will test it again with a bit more iron. I wasn’t after anything that pale. I have been talking to people about my wood kiln all weekend and lots of them have been watching it’s progress and were interested (though bemused maybe by my excitement) to see the results. I found it frustrating trying to explain that although it wasn’t perfect it didn’t mean that the whole kiln “didn’t work” and needed to be torn down. I struggled to explain it in a couple of sentences and without getting to the point where I was boring people to death. Quite a few said along the lines of well what did I expect, you couldn’t ever get it hot enough with wood which threw me the first time I heard it. Needless to say they probably now know more than they ever wanted to know about why I want this kiln and what I want it to do and why I am so thrilled about bubbly pots. Anyway I am still looking at all the pots sat here at work and it is SO VERY EXCITING!!!! I can’t tell you how many times I’ve picked them up and flapped about (I probably should be more careful and do less flapping whilst holding pots). I want to get on with firing it again. The thing is after a very successful Spring Fling my shelves are looking somewhat barren and Earth and Fire is running up fast. I think I need to concentrate on finishing work for that and wait until after that to have another shot. I’d have loved to have had some wood fired pots for then but I need to be sensible I think and get some decent pots sorted first. 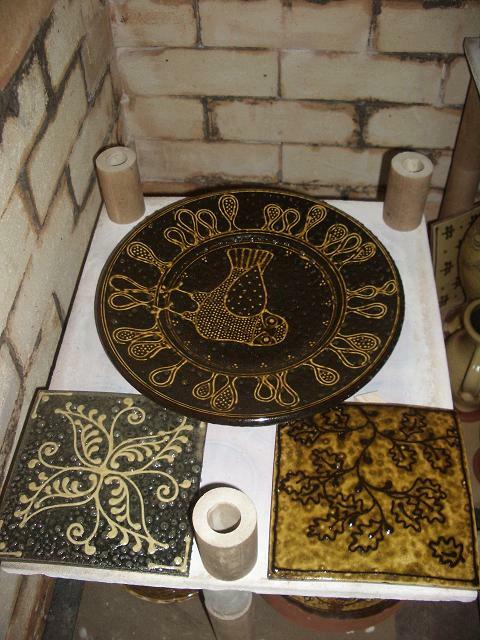 This entry was posted in wood fired pots, wood kiln. Bookmark the permalink. Seems like everything has a learning curve doesn't it? I like the leopard glaze and think there is a place for that white too even tho it was not what you expected. See if it grows on you.Give Mr. Fitch a sound chiding and try again.Keep us posted. Very inspiring Hannah despite some of the results. Well done!! Good luck getting ready for E&F. Hey Hannah,Congrats on the first firing – always the hardest. Re: the reduction I've got a sneaking suspicion that your chimney isn't big enough (?) in cross section. Metal chimneys are often problematic + it might be better to grit your teeth and build a brick one. Thick wood could be it but essentially there isn't enough air getting into the kiln. Bigger chimney + maybe more open up the front. Yes, there's always a learning curve, particularly with wood. 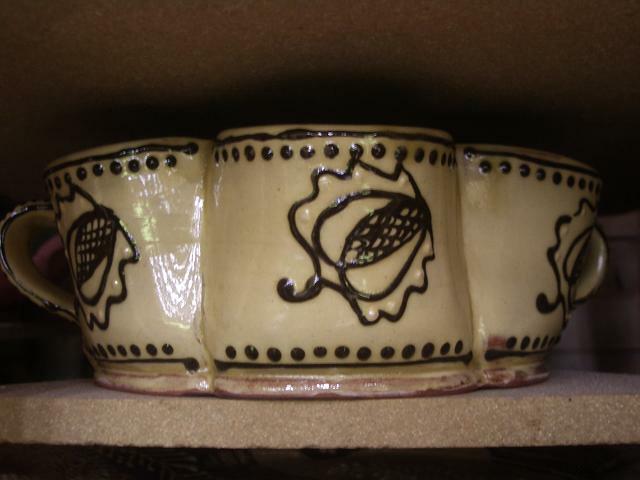 And particularly in the first firing or three. But there are good things in there. Now it's time to make some adjustments, once you figure out what they might be. And it's always brave to post those first pots. Well done, H.
It is a great start! It can only get worked out as things go along!